According to this week’s market reports, rent prices are up in Brooklyn, Manhattan and Queens, but barely. New York is behind Mexico City as the least affordable city on a list of 30 global metros. Rental prices inched upwards in all three markets in May relative to the previous month, with 0.5 percent in Manhattan, 0.3 percent in Brooklyn, and 1 percent in Queens. In Queens, Long Island city was the priciest on average for studios, one- and two-bedrooms. Read the full reports for Manhattan, Brooklyn, and Queens. Twenty-one contracts were signed last week at $4 million and above, with an average 13 percent discount from asking price. The total asking dollar volume was $178 million. Read the full report here. In New York state, 10,704 home sales, up by 4.6 percent from May 2016. Median sales price continued its upward climb, increasing by 7.1 percent compared to last May. Read the full report here. In New York City, post-rent income growth, or the income that remains after paying for rent, increased by 7.7 percent for knowledge workers, but decreased for blue-collar and service workers by 4.9 and 9.4 percent. Read the full report here. 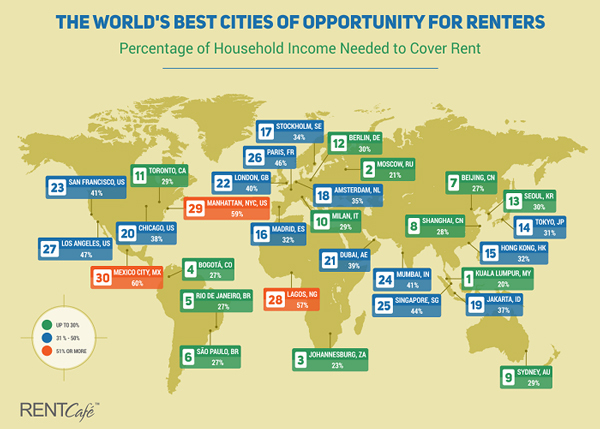 New York City came second only to Mexico City, where median rent requires 60 percent of median income. In New York, it’s 59 percent. Read the full report here.